Teaching in a New York City public school, it’s so important to commemorate September 11. This is not only part of our nation’s history, but something that has directly touched the lives of so many families in New York. Even though my students, being in 4th and 5th grades, were not yet born in 2001, 9/11 is a date that they too will never forget. There are some phenomenal developmentally appropriate picture books to explore 9/11 with young learners. 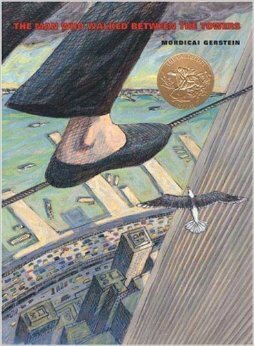 For very young students (Kindergarten-2nd grade): The Man Who Walked Between the Towers by Mordicai Gerstein celebrates the two World Trade Center towers, which dominated the New York City skyline. It is the story of a French aerialist named Philippe Petit who tightrope walked between the two towers in 1974. 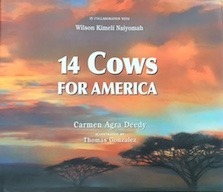 My colleague recommended 14 Cows for America by Carmen Agra Deedy for use in my 4th grade class. This story takes place in a small village in western Kenya in 2002. The main character Kemeli, returns to his home village and shares with his people, the Maasai the story of September and New York. Touched by the story of human suffering, the Maasai decide to bestow the gift of 14 cows to the Americans. When I introduced the story to my students they asked, “Why cows? What does this have to do with September 11?” After reading the story, I asked the class, “So, why cows?” They were able to understand that the cow represented life for the Maasai people. The gift of 14 cows was a symbol of their empathy for the Americans. 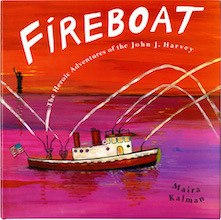 A third book to commemorate 9/11 is Fireboat by Maira Kalman. This book explains the events of September 11 in as kid-friendly a way as possible. The story begins by describing the John J. Harvey a fireboat that served New York City from 1930-1990s, when it was retired. It includes the building of the Empire State Building and the completion of the George Washington Bridge. On the tragic day in September, the John J. Harvey is called out of retirement to serve the City once again. This is a story of community and coming together during an unimaginable time in our history.